Olive squalane knows a tremendous consumption since Shark liver oil is prohibited in cosmetics in Europe. Its exceptional sensorial profile including an excellent skin biocompatibility with moisturizing effect made it as the favorite for cosmetic formulators. For structural reasons, Olive squalane availability impacts negatively on its price which increased year after year. A new and non-reversible technological trend in olive oil industry (physical refining) combined to conjunctural phenomena such as bad climatic conditions of industrial practices in olive oil refining invasive insect’s attacks (mosquetaoleifera infestation in italy) remove the ensure an adequate availability of Olive squalane with offering it at low price. Otherwise the replacement of Shark squalane which remains the main squalane source in cosmetics worldwide, is became a priority in term of biodiversity safeguard to avoid shark’s species extinction which are already vulnerable. In this context innovation is needed to develop a new alternative to Olive squalane which is cosmetically identical, 100 % vegetable, readily available without any risk of supply shortage, ecofriendly, sustainable and cost efficient to compete efficiently with Shark squalane. 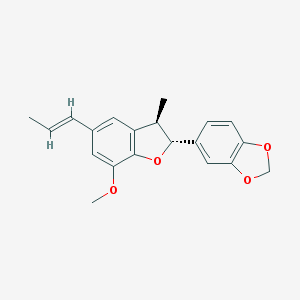 Squalane (2,6,10,15,19,23-hexamethyltetracosane, see figure-1) is obtained from a natural triterpene named squalene (6E,10E,14E,18E-2,6,10,15,19,23-hexamethyltetracosa-2,6,10,14,18,22-hexaene, see figure 2. Squalene is one of the most important human skin cell lipids. It is synthesized in the sebaceous glands where it accounts for up to 13% of total sebum lipids2. Squalene is also found in a variety of foods, cosmetics, over-the-counter medications and health supplements. In pharmaceutical industry, squalene is present in the form of an emulsion and is added to make the vaccine more immunogenic3. Several experimental vaccines including pandemic flu and malaria vaccines which are being developed. In this case, squalene is commercially extracted from fish oil, and in particular shark liver oil. High purity Squalene used in pharmaceutical products and vaccines is purified from this source. Due to its multiple double bonds, squalene is very sensitive to air and is considered as a fragile compound for most practical uses. 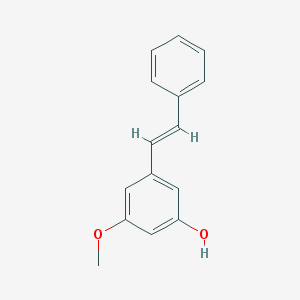 In 1950, Sebastien Sabetay a French chemist developed a stabilized form of squalene : squalane (or perhydrosqualene) obtained by the complete hydrogenation of squalene4. This innovation allowed the use of squalene in cosmetics and it became a very important ingredient in skin care for many reasons : total absence of toxicity, low odor, translucid liquid, moisturizing properties, and in particular excellent sensorial properties making it quickly one of the preferred emollients. Preventing moisture loss while restoring skin’s suppleness and flexibility, squalene is now considered by the cosmetic formulators as the reference. According Cosmetics design-europe.com, the global consumption of squalene / squalane is expected to be higher than 4 000 tons by 20195. Shark liver oil is the most important source of natural squalene6. It is isolated from fish oil by high vacuum distillation. Some sharks have as much as 90% squalene in the liver and, because of its low specific gravity, thus maintain their buoyancy in water. Amaranth seed oil is the second natural source of squalene but the poor oil content of the seed (6-7 wt%) and the absence of an oil refinery industry for amaranth crushing do not allow to use it as raw material to produce squalane. A study carried out by Bloom and investigative journalist Romain Chabrol found that around 90% of world shark liver oil production feeds the needs of the cosmetics industry, which corresponds to 2.7 million deep-sea sharks caught every year11. The 2012 global demand for shark liver oil is estimated at 2000-2200 tons (a more than 20 % decrease compared to 2010). Around 90 % of this total is used in the production of squalane for the cosmetics industry, around 9 % by the nutraceutical industry and 1 % by other sectors. Over three million deep-sea sharks are needed each year to meet the needs of the shark liver oil market. Deep-sea sharks are inherently vulnerable to fishing, even if caught in low numbers. Species such as the Gulper shark, the leafscale gulper shark and the Portugese dogfish are already in danger of extinction in the Northeast Atlantic. Only in Europe does the market seem to have moved predominantly towards plant-based squalane (olives and other). Today the majority of the global squalane production seems to be derived from plants while it only represented 30-40% of the global production by the end of 2010. – the Olive squalene losses during extraction and squalane production process. 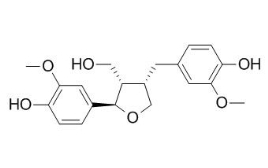 Shark squalene is concentrated from shark liver oil by a simple process of molecular distillation and the corresponding squalane is produced in a 2-steps process including hydrogenation and a purification treatment (see figure 2). The squalane is obtained in high yield (> 90 wt%) and presents a purity higher than 99wt%. Concerning olive oil production, more than 750 millions olive trees are cultivated worldwide, the greatest number of which (c. 95%) being planted in the regions of the Mediterranean. About 75 % of the global olive oil production come from the European Union, while around 97% of European production comes from Spain, Italy and Greece. These olive trees produce 2.5 million tons of olive oil and some million tons of edible olives. The fact that only the minority of olive oil production is extra virgin olive oil and that olive oil consuming is raising, makes olive oil refining a very important sector of food industry. Crude olive oil (named lampante olive oil) has to be refined and a process to make this oil edible was the target of olive oil refining industry. In the traditional olive oil chemical refining consists to remove impurities such as phosphatides (degumming), free fatty acids (with treating oil in the presence of sodium hydroxide), pigments (bleaching) and odor (steam deodorizing). Deodorizing consists to heat the oil at high temperature (220 °C) under vacuum and in the presence of steam water to remove all of the undesired volatile components. During the deodorizing step, fatty acids, glycerides and unsaponifiable compounds including squalene are stripped and condensed to form acid oils. Olive acid oils constitute the raw material for Olivesqualane production (see figure 3). 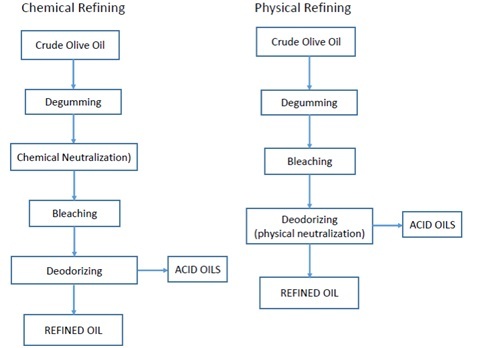 The squalene content in acid oils depends on the refining process, chemical or physical refining (see figure 4). In chemical refining crude oil is water-degummed (phosphatides removing), neutralized by sodium hydroxide, winterized (waxes elimination), bleached and deodorized at high temperature under vacuum and steam water. In physical refining crude oil is not neutralized by chemicals (caustic soda) but during the final step of deodorizing. The squalene content in acid oils depends drastically on the type of refining which is used (see Table 2). In chemical acid oils issued from chemical refining squalene content is close to 20 wt%. In some cases, squalene can be present at high levels comprised between 20 and 40 wt%12. Physical refining acid oils are characterized by a lower content in squalene (< 10 wt%) and high acidity (> 50%). The global content in unsaponifiable components is drastically reduced versus chemical refining’s coproducts. Physical refining is particularly adapted to crude oil presenting high acidity (> 3 wt%) such as palm, coconut, olive and rice bran oils. Physical refining presents economical and environmental advantages with reducing significantly oil losses during refining induced by chemical neutralization and with eliminating the formation of large amounts of wastes as soapstocks. It’s the reason why in olive industry the trend is to replace chemical refining by the physical one with the consequence to reduce drastically the squalene content in acid oils. Moreover, the physical acid oils contain more waxes and squalene isomers (eg. cyclic squalene) than the chemical refining’s co-products. The direct consequence is to complexify the production process of squalane inducing often supplementary losses of the target product and thus the corresponding production costs. With optimizing the refining cost, physical refining is progressively adopted in vegetable oil industry worldwide14 especially in olive oil factories. Moreover olive supply chain is subject to other uncertain conditions such as climatic conditions (eg. rainfalls) and to insect’s attacks (mosquetaoleifera infestation in Italy). At the present time, squalene in acids olive oils represents around 85 % of the final cost price of squalane. This level has to be considered as non-reversible. In this context, new alternatives to Olive squalane become a priority. The market is expected to witness a lot of developments in the next five years in the form of collaborations and innovations through R&D activities5. – significantly cost efficient versus Olive squalane. – assessed sustainability according to the reference standards (ISO 14040:2006 and 14044:2006 related to Life Cycle Analysis). In this goal Sugarcanesqualane has been developed in the last few years. It is obtained by a biotechnological process from glucose fermentation in the presence of a genetic modified strain15. In a first step, sugarcane glucose is transformed in farnesene corresponding to the hemisqualene (C15). Afterwards farnesene is chemically dimerized in squalene which is finally hydrogenated intosqualane. The purity of sugarcane Squalane is close to 92-94wt % with a total C30 content of 99 wt%16. In the field of natural cosmetics and according the new rules of COSMOS certification recently adopted, the use of a genetic modified organism as a processing aid is not permitted. A new vegetable substitute (trade name EcoSqualane®) composed of amixtof olivesqualaneandlong chain branched coconutalkanes has been developed. C20-36 long chain coconut alkanes are obtained in high yield from coconut fattyalcohols by a green chemical process without any solvent and in the presence of reusable catalysts. In term of process efficiency and according to the main green chemistry criteria, the resulting E-factor is higher than 0,9 and the atom economy close to 95 %. As a reminder, by comparison with refined olive oil, coconut oil is an abundant vegetableoil – min. 3 millions tons per year – with a high productivity and cheap, preventing any risk of supply shortage (see figure 5). The chemical structure of the branched alkanes is very close to an hexamethyltetracosane and can be considered as a biomimetic Coconutsqualane. The resulting physicochemical properties of EcoSqualane® are similar to Olive squalane (Table 3). EcoSqualane® is colorless and odorless transparent liquid. The content in vegetable alkanes is higher than 99 wt% and low content in cyclic alkanes vsOlive squalane : 2 wt% max vs 5wt% min. 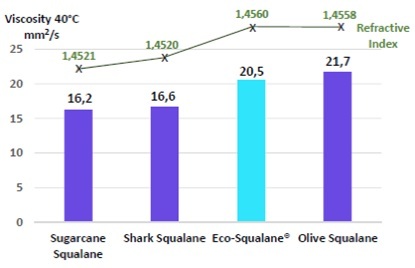 The comparison of the physical and chemical properties of EcoSqualane® versus shark, olive and sugarcane squalaneschows its high similarity with olive squalane (see figure 6). 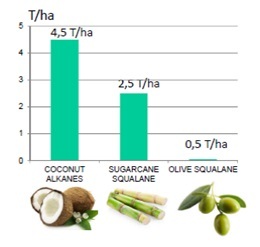 In term of viscosity, olive squalane and EcoSqualane® are slightly more viscous than sugarcane and shark squalane. High purity squalanes, sugarcane and shark, are significantly less viscous. Viscosity differences induced by the presence or the absence of cyclic squalane, are often detected by cosmetic formulators during self-assessment of sensorial properties. Moreover, we note that in term of light properties (refractive index value), sugarcane and shark squalane are significantly different than EcoSqualane® and olive squalane. As a reminder, in the field of emollients differences of refractive index express significant differences in light capitation behavior inducing a direct impact on the skin brightness after application. The textural properties of EcoSqualane® versus olive and sugarcane squalane are assessed by different instrumental methods including conventional texturometer and goniometer which are very performing devices to objectivate rheological behavior of cosmetic ingredients especially emollients17. Instrumental methods are preferred to self-assessment to reduce the uncertainties often induced by human inter-variability. 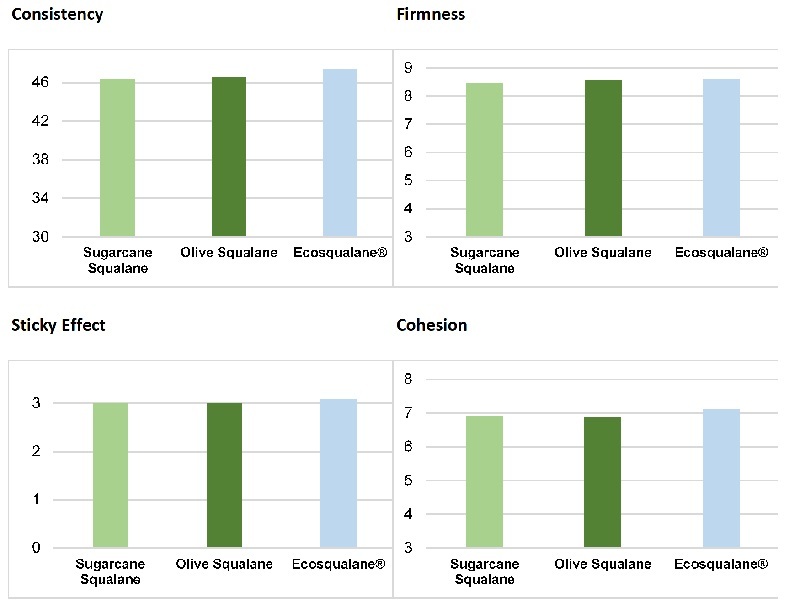 In Figure 7, the textural properties of EcoSqualane® versusOlive and Sugarcanesqualane are presented. In the conditions of texturometry test no significant differences are observed between EcoSqualane®, olive and sugarcane squalane in terms of cohesion, firmness, sticky effect and firmness. We note that EcoSqualane® matches perfectly with olive squalane. Quite the opposite, regarding spreading properties assessed by goniometry, significant differences are observed between EcoSqualane®, olive and shark squalane (see figure 8). Regarding spreading behavior, EcoSqualane® matches perfectly with olive squalane and on the opposite sugarcane squalane is significantly less spreadable. Finally EcoSqualane®’s sustainability and environmental impact are assessed by a life cycle analysis (LCA) versus olive and sugarcane squalane. Standardized methods ISO14040:2006 and 14044:2006 are applied. The study is a « cradle to gate » type study which the most recommended model in the field of life cycle analysis to assess the environmental impact of chemicals. As a reminder, for vegetable ingredients the plant production part takes into account the agricultural practices including water needs, fertilizers and pesticides uses, transport which have generally a strong impact on the fossil energy consumption and warehouse gases emissions. The standardized endpoints of the study are the global warming potential (GWP expressed in Kg CO2 equivalent / kg of product), the mineral and fossil resources exhaustion (expressed in Kg antimony equivalent/ kg of product), the soils acidification (kg SO2 equivalent / kg of product), the impact on aquatic eutrophication (Kg phosphate equivalent/ kg of product), the photochemical pollution (or impact on ozone layer depletion expressed in kg normal methane / kg of product), the ecotoxicity (expressed in chronic toxicity unit, CTU / kg of product), the impact on water resources ( in liters/ kg of product) and the impact on energy consumption ( in mega joule / kg of product). 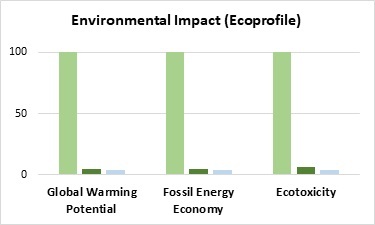 The results of the comparative life cycle analysis demonstrate that for the totality of the study endpoints, EcoSqualane® presents a better environmental impact than olive and sugarcane squalane, especially on the global warming potential, fossil energy economy and in term of ecotoxicity (see figure 9). EcoSqualane® and olive squalane have an equivalent lower environmental impact. For information, according OCDE standardized methods, EcoSqualane® is readily biodegradable and non ecotoxic. These results demonstrate that EcoSqualane® can be considered as an ecofriendly ingredient and with a very correct naturality index. EcoSqualane® is COSMOS and VEGAN compliant. Structural and durable conditions impact negatively the availability and price of olive squalane which is issued from a unique supply, olive acid oils significantly lowered in squalene. In this context and to replace shark squalane in cosmetics and to protect shark’s species already in danger of extinction, innovation is needed to develop sustainable and cost efficient olive squalane substitutes. In this context EcoSqualane® appears to be a real and efficient alternative to olive and shark squalene : 100 % vegetable, matching perfectly the cosmetic sensorial properties of olive counterpart, ecofriendly and sustainable, readily available without any risk of supply shortage and significantly cost efficient versus the poorly available and expensive olive squalane. Biochemistry. 5th edition. Berg JM, Tymoczko JL, Stryer L. New York:W.H. Freeman 2002. M. J. Bakes.Lipid, Fatty Acid and Squalene Composition of Liver Oil from Six Species of Deep-Sea Sharks Collected in Southern Australian Waters. Comparative Biochemistry and Physiology Part B : Biochemistry and Molecular Biology. January 1995, Pages 267-275. Frega N., Bocci F., Lercker G., Direct Gas Chromatographic Analysis of the Unsaponifiable Fraction of Different Oils with a Polar Capillary Column. J.Am.Oil.Chem.Soc., 1992; 69(5) : 447-450. B. Rodas, R. Bressani. The Oil, Fatty Acid and Squalene Content of Varieties of Raw and Processed Amaranth Grain. Arch LatinoamNutr 2009 Mar;59(1):82-7. Romain Chabrol / Greentrax. The Hideous Price of Beauty – An investigation into the Market of Deep-Sea Shark Liver Oil. BLOOM Association, November 2012. K. Antonopoulos, N. Valet, D. Spiratos and G. Siragakis. Olive Oil and Pomace Olive Oil Processing. Grasas Y Aceites, 57 (1), enero-marzo,56-67, 2006. W. De Greyt, V. Gibon and M. Kellens. Recent Developments in Bleaching, Deodorisation and Physical Refining of Oils and Fats. OFI Middle East 2008 Technical and Commercial Conference Hilton Hotel Abu Dhabi, UAE, April 15-16,2008. G. Savary, M. Grisel, C. Picard . Impact of Emollients on the Spreading properties of Cosmetic Products : A Combined Sensory and Instrumental Characterization. Colloids and Surfaces B: Biointerfaces. Colloids and Surfaces B: Biointerfaces 102 (2013) 371– 378, 2012.